Installing Solar Photo voltaic panels is a great way to reduce your electricity costs and generate a long term income from the governments Feed-in Tariff. Our team has installed systems on most types of buildings with a wide range of roof types. We have been recently working with a number of customers to develop small scale off grid Solar PV for buildings that have no mains connection. 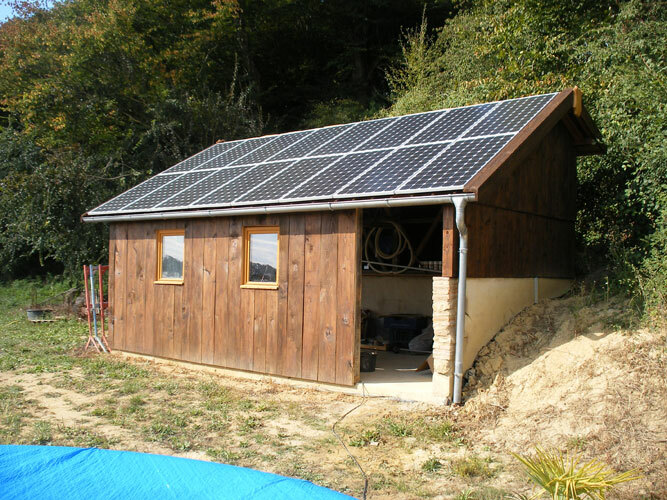 These systems include Solar panels, batteries and 12v LED lighting systems. The batteries are providing the storage capacity to run a standard 230v fridge, TV and phone/laptop charger all year around. The next project includes linking a wind turbine to maximise useful energy storage all year round. Installing Solar PV on your home is still a good way to reduce your bills. You will save on the rising cost of electricity for every kWh generated and also recieve a Feed-in tariff subsidy and export income. We specialise in packaging up Solar PV with Battery Storage and Car Charging points to maximise your energy saving. Our teams have a combined experience in implementing over 1000 Solar PV installations for customers in a wide range of sectors including Education, Healthcare, Charity, Commercial, Housing Association, Retail. Installing Solar is still a good investment and can save on longer term electricity costs. Offices are inhabited during the day so it makes perfect sense to install solar pv and use the energy generated with the sun is shining. Systems can range from 10KWp to 1000KWp but most tend to focus on smaller systems. We have been involved in a number of ground mount projects designed to provide the grid with significant energy from one location. Smaller scale projects work well when dealing with listed properties with large grounds. Larger scale ground mount projects tend to be "investor led" and our team works with Funders and Investors to design systems that maximise their return on investment whilst reducing design and implementation risk. Profits from these projects are used subsidise our work for Schools and the third sector. Our MD, Mark Stevenson, has been invited to talk about Solar PV at the popular “Green Drinks” talks run by Geoff Barnard and the Steyning 1010 Climate group on Wednesday 31st October 2018 at Steyning Cricket Club. The session will also include a Q&A on energy issues. Feed-in Tariff closing April 2019. Cutting energy costs - is renewable energy the answer? Becoming more environmentally sustainable is becoming increasingly more important from a financial perspective as well as the right thing to do says Mark Stevenson, Director at Bright Spark Energy. How you can make your home energy efficient. Being more energy conscious will not only help you to save your hard-earned money, but will reduce your carbon footprint, helping to save the planet one ‘switch’ at a time. This is achievable by making a number of small changes to your daily life. How Bright Spark Energy helped a company significantly save on rising electricity bills! The Steyning Downland Scheme Charity has recently completed the construction of a new 'gateway' building at the entrance to their Nature Reserve for use by schools, community groups and the general public. The team at Bright Spark will sponsor the gateway building by donating an “off-grid” Solar PV system with battery storage and LED lighting to extend the use of the building to all year round. The Bright Spark team have been working extremely hard over the last few weeks converting our very own HQ and Eco Barn just outside of Arundel, West Sussex.